Processing Time = One to three business days to get your order looked at, your credit card authorized (checks and money orders will take longer), and to make sure the ship-to address is on file with your credit card company. Minimum time: 1-3 business days. We do not process your order on Sunday or holidays. Allow an additional 1 to 2 business days for weekend orders. Warehouse Time = We send your order to the warehouse, after your order is processed, . If the product is still in stock, it will be shipped in a day or two. Shipment Time = The time it takes for the shipping company to delivery your product to you. Rush Order (Fee: $6): FedEx Ground and USPS - When order before 1:00PM eastern time, we will process your order as soon as possible and ship it the same day. FedEx Express Shipping with Rush Order Fee (Fee $6) - Order before 3:00PM eastern time, we will process your order as soon as possible and ship it the same day. Your shipping fee is calculate by FedEx or USPS base on the items weight and your shipping location. We do not make up the shipping fee. 3. What shipping methods do you use? iHomewholesale.com provides various shipping methods. All merchandise can be delivered by package carriers of Federal Express or USPS (United States Postal Service). These carriers deliver your merchandise directly to your door. 4. Can I track my package? you will received an email with tracking number and the shipping company. Please go to the FedEx or USPS website to track your package. 5. How do I ship to multiple addresses? If you need to send items to multiple addresses, you must place separate orders for each address. 6. 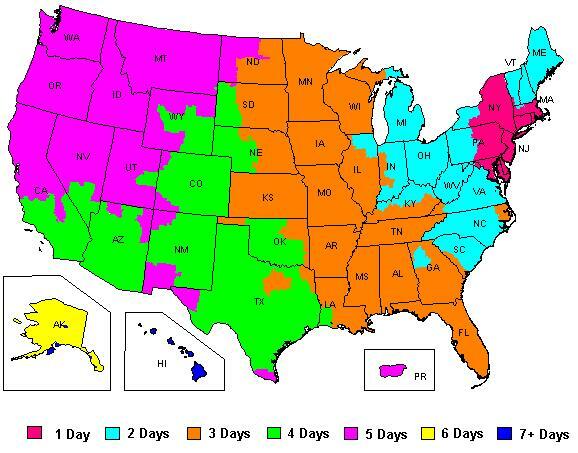 Will ihomewholesale.com ship outside of the U.S.? Yes, ihomewholesale.com offers shipping in United States and other country now. Note: We use United States Postal Service for Priority Mail international and Express Mail International shipments. We also use FedEx International Economy and FedEx International Priority. Please be aware that your local Postal Service will not inform you when they received the package. 7. Do you ship to P.O. Box? We do do ship to PO Box with USPS only. You must choose First Class Mail, Priority Mail, or Express Mail shipping for All PO Box address. FedEx International Ground to Canada Clearance Fee is include in the shipping fee.